If you haven’t had the pleasure of tasting mochi ice cream or you haven’t even heard of it existing, then today is your lucky day. This frozen snack is unlike any version of ice cream that you have ever licked in your lifetime, and this is your opportunity to introduce a box of it to your freezer. This enhancement of your summer favorite is made of a premium scoop of ice cream and then draped in a soft and gooey layer of sweetened rice dough called mochi. You can taste this elevated snack by simply walking through the frozen food section of your nearest grocery store and picking out a box of My/Mo Mochi ice cream. The only problem you will encounter is deciding which flavor you will want to test out first — you can try an indulgent flavor like cookies and cream mochi ice cream, a classic one like vanilla bean mochi ice cream or a unique one like green tea mochi ice cream. When you’re done debating about which box to take home, here are three different ways that you can eat this cold snack. 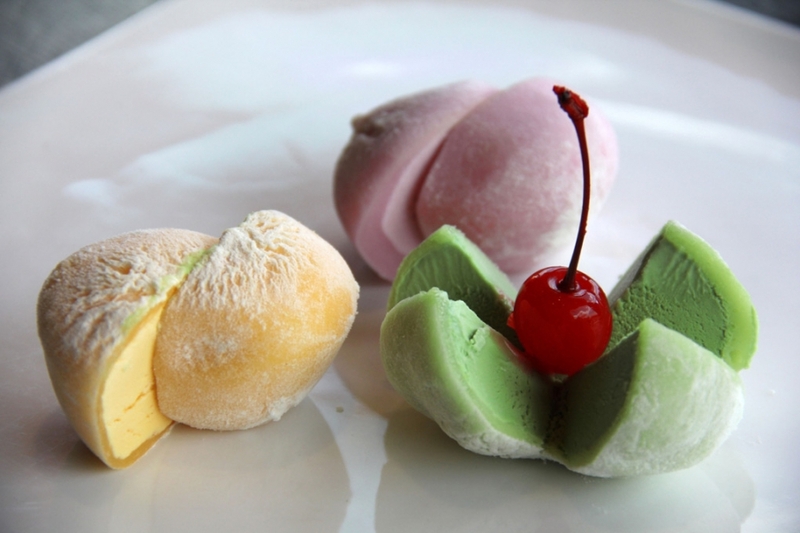 If you want your guilty-pleasure to feel a little less guilty, eat your mochi ice cream with a healthy portion of fruit. Take the time to make a batch of gourmet oven-baked peaches and then place a vanilla bean mochi ice cream ball in the middle—in the summertime, you can grill the peaches on the barbeque. If you hate to clean up or wash dishes, mochi ice cream and edible chocolate bowls are the perfect combination for you. You can make yourself crisp chocolate bowl by dipping blown balloons in melted white, dark or milk chocolate—after the chocolate hardens, pop the balloon and throw the remaining pieces in the trash. This clever creation will make sure you get more dessert and guarantee that you enjoy every single bite of it. Place a single sphere of delicious mochi ice cream between two freshly baked cookies to experience a real upgrade from a plain old ice cream sandwich. To end up with a tasty flavor combination, choose the best cookies to go with ice cream flavors that you have in your freezer unless you want to take a risk and end up with a mismatched pair. If you are too impatient to prepare some baked peaches, homemade chocolate bowls or batches of cookies, you can always eat the first sphere on its own. You don’t even have to bother waiting until you get home from the grocery store — after you’ve made your purchase, feel free to tear into that box and savor your new favorite treat.